grace for the living, and everlasting life for all. Most Blessed Trinity, forever and ever. Amen. Glory to the Father, to the Son, and to the Holy Spirit. Jesus is innocent. He did not and could not sin, but he is condemned to death. Indeed, he is condemned to the most humiliating death of the Cross. Pilate delivered Jesus into the hands of his enemies, so that he might remain a friend of the emperor. Dreadful injustice! Pilate does not fear to condemn innocence and offend God, so that he might please other men and the world. Jesus Christ beholds the Cross. With greatest desire, he extends his arms, already soaked in blood, and gently embraces the Cross. He kisses it, places it upon his shoulders, and although weary unto death, rejoices as he begins his way of pain and suffering. Feverish and oppressed by the weight of the Cross, Jesus falls to the ground. Certainly, my sins are the weight that caused this unbearable burden. And yet, because of his love for me, Jesus carried the weight as if it was both sweet and light. Mother Mary sees her beloved son carrying the heavy burden of his Cross. Her glance is both afflicted and deeply sorrowful. After being beaten by his tormenters, his entire body bleeds. His mother’s most tender heart shares his unspeakable pain and anguish! She longs for her son! She longs to suffer and die with him! Simon of Cyrene is required to help Jesus carry the Cross. Jesus is crippled and wasted because of my sins. Although reluctant to share the burden, Jesus accepts Simon’s help. How pleasing a companion Simon might have been if he had embraced the Cross by choice rather than by coercion. O my soul, Jesus invites me to embrace my Cross and follow him. But I shamefully resist. How pleasing a companion I might make if I embrace the Cross by choice rather than by coercion! By compassion and devotion, Veronica offers her veil so that Jesus may wipe his face which is stained by blood and spit. Jesus returns the veil with the image of his holy face imprinted upon it. Such a small thing offered in exchange for such a heavenly gift of the face of Christ Jesus! Jesus falls again under the weight of his suffering, under the burden of the Cross. He strikes the ground with his sacred face, but his executioners offer no comfort or rest. By clubs and ropes, Jesus is forced to stand and continue his walk, carrying the Cross. My repeated sins have caused this second fall. Am I pleased to sin again and again? The devoted daughters grieve and weep for their savior. But he turns to them and says: “Do not weep for the innocent. Weep for yourselves and for your children.” I weep for my sins because they are cause of so much suffering. Weep, my soul! Nothing is more pleasing to Christ Jesus and more useful to the cause of my soul than tears shed with sorrow for my sins. Jesus is despised. He is a man of sorrows. He knows weakness. He embraces and carries this Cross for us and for our sake. Reaching now the foot of Calvary, he falls violently for the third time. How savage and sorrowful is the weight of my sin! As many times as the Cross has forced Jesus to the ground, already long ago it would have thrust me into hell – except that Jesus saves me through his most holy passion. O Jesus, your garments are violently stripped from your body. Because these garments clung to your open wounds with blood and sweat, the pain is excruciating! You will die humiliated and naked! Like you, I shall die naked and humiliated – humiliated by my actions, failures, and sins. 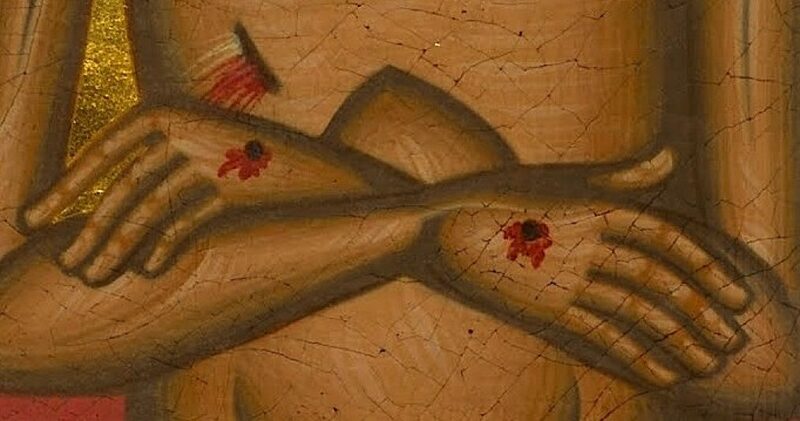 After being stripped of his clothes, Jesus is cruelly stretched upon the Cross. His hands and feet are mercilessly pierced with nails. Such pain! Such torture! But Jesus is silent because he suffers willingly for me, for love of me. O my soul! How can you stand your sinfulness? How impatiently do you suffer the smallest insult or indignity? Jesus hangs upon the cross. He is naked, bloody, and mortally wounded. He embraces this horrific suffering for me, for love of me. His crucified body is a symbol of love. His head is lowered to kiss me. His arms are outstretched to embrace me. His love for me is so great. Every one of his wounds can be counted as a pledge of love. Jesus dies so that a sinner may live and be freed from eternal death. But so sadly, while his love for me is so great, it is so poorly repaid! Jesus refused to come down from the Cross in life. Even in death, he clings to it. When he is taken down from the Cross, Jesus rests in the virginal lap of his Blessed Mother. Like Jesus, I must be steadfast in my resolutions by clinging to the Cross. If I persevere, I will be saved. With purity of heart, I may humbly receive my Lord Jesus Christ in the Most Blessed Sacrament. Jesus is buried in someone else’s tomb. On the cross, he did not have a place to rest his head. In death, Jesus did not have his own tomb in which to rest because he was not of this world. I may now live in this world, but I seek not to depend on it. I shall denounce the world and its vice so that I may not die with it. Give me right faith, certain hope, and perfect charity. your holy and truly will. Amen. Saint Michael the Archangel, protect us! Source: Various versions of the Franciscan Way of the Cross are available online and in printed formats. This version was adapted from an English translation of a medieval Latin text.